Figural engagement rings are a startling alternative to those featuring classic diamond settings. For truly creative couples, figural designs just might be the perfect choice. What Are Figural Engagement Rings? A figural engagement ring is a piece of jewelry specifically crafted to represent a definitive form, such as an animal, natural object, or other figure. In essence, it is a figurine for the finger. The most common figural rings are animals, but other shapes including crosses, treasure boxes, letters, and flowers. Most figural rings involve the figurine shape forming both the setting and band of the ring, but some designs use the figure as a highlight or setting attached to a plain band. Common animals for figural rings include dolphins, cats, and serpents - animals with natural grace and flexibility that does not look distorted when wrapped into a circle. In fact, Queen Victoria's engagement ring was a serpent, a creature believed to symbolize good fortune. Typically, the animal is wrapped around the finger and is holding or biting its own tail where the two ends meet. 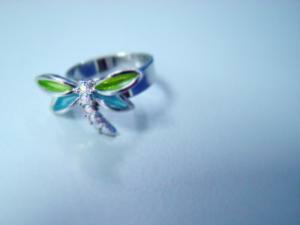 Insects, butterflies, and other animals that cannot wrap around the finger are set similar to more traditional rings. Letters are another common choice for figural engagement rings. Letters may spell out the couple's initials or specific words, such as "love" or "forever". Dates can also be used, such as the proposal or wedding date. Gemstones can be used in two ways in figural designs: as complete figurines or as accents to metallic figures. To create the complete figurine, such as letters or numbers, gemstones may be incorporated into pave settings. Simple geometric figures such as butterflies or flowers can be created entirely out of gemstones as well. In fact, a heart shaped stone is the simplest form of figural engagement ring. The more common use of gemstones in figural jewelry is as accents. Most animal figural rings will use gemstones for the creature's eyes, colorful highlights such as a snake's scales, or the animal will wrap around a solitary stone to create a figural solitaire ring. Because the accent stones are so small, rich colors such as rubies, emeralds, or sapphires are most popular to insure the stones are visible without overshadowing the intricacy of the ring. Figural designs can be very difficult to find. Most jewelers will offer a limited supply of common designs, such as flowers or butterflies, but only specialty jewelers will stock more intricate rings. Online merchants may have a better selection of different figures, but always investigate the seller thoroughly to protect your investment, especially since it is so unique. 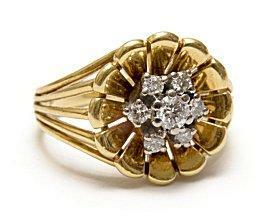 Pawn shops and estate sales are other options that may offer figural rings. The cost of varies greatly depending on the type of metal and gemstones used, as well as the intricacy of the ring. Like all engagement rings, figural rings need careful handling and cleaning to keep them looking their best. Because accent stones may be set gently into the ring's band or metal, they can be more easily dislodged than sturdier prong settings and the ring should never be worn during strenuous activities such as sports or house cleaning. The intricate details of the ring may require more frequent cleaning to eliminate dirt, dust, and oil build-up, and you should always use the cleaners specifically recommended for the ring's metal and gemstones to prevent unintentional damage. Figural engagement rings are remarkably unique and specialized, and they are a beautiful and symbolic alternative to traditional engagement ring designs and engagement ring settings. Though more difficult to find, the extra investment will be well worthwhile for a truly individualized ring.